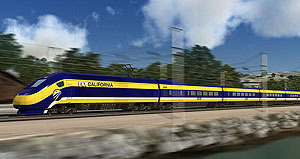 The fast trains connecting Los Angeles and San Francisco would create new communities of high-density apartments and small homes around stations, reducing the suburbanization of California, rail advocates say. That new lifestyle would mean fewer cars and less gasoline consumption, lowering California’s contribution to global warming. ….Opponents, most of whom are political conservatives, regard the ambitious project as a classic government overreach that will require taxpayer subsidies. But they also see something more sinister: an agenda to push people into European or Asian models of dense cities, tight apartments and reliance on state-provided transportation. So who spilled the beans, anyway? Now the whole world knows that we lefties are drooling over the prospect of taking away everyone’s homes and engineering a forced march into modern-day high-rise concentration camps where the cable companies don’t offer Fox News. All the better to control you with, my sweeties.